The Digital Imaging and Remote Sensing Image Generation (DIRSIG™) model is a physics-driven synthetic image generation model developed by the Digital Imaging and Remote Sensing Laboratory at Rochester Institute of Technology. The model can produce passive single-band, multi-spectral or hyper-spectral imagery from the visible through the thermal infrared region of the electromagnetic spectrum. The model also has an very mature active laser (LIDAR) capability and an evolving active RF (RADAR) capability. The model can be used to test image system designs, to create test imagery for evaluating image exploitation algorithms and for creating data for training image analysts. 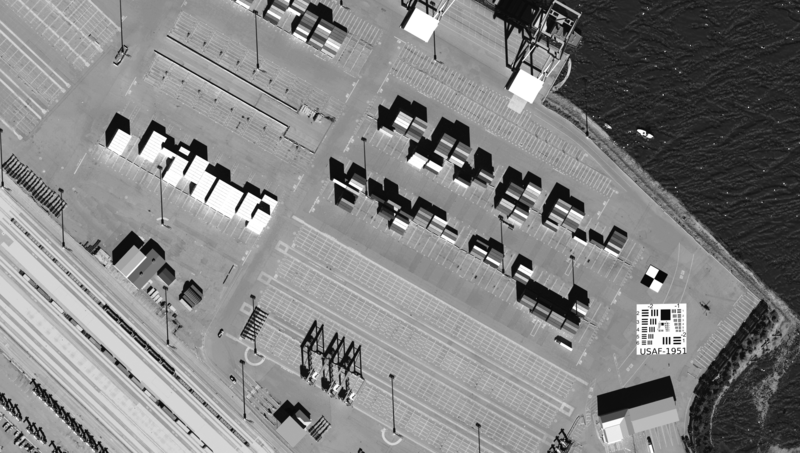 DIRSIG™ simulation of a low-earth orbiting pan-chromatic framing array system viewing a 3D scene of the Port of Tacoma. How do I get DIRSIG™? If you think that the DIRSIG™ model might be useful to you, click here to read how to get a copy of the model. Information about the software license is available here. To learn more about the model watch the video overview.